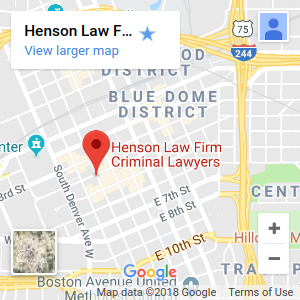 The HENSON LAW FIRM, PLLC is based in Tulsa and focuses its practice on Oklahoma Criminal Defense. We represent clients in Tulsa, Oklahoma and the surrounding communities and counties. We believe that when your liberty is at stake, you need an aggressive defense to protect your rights. We make it a priority to become thoroughly familiar with all aspects of your case. We don’t just think like lawyers, we work to find the best solutions to your legal problems not only in the courtroom, but outside of it as well. If you need a Tulsa criminal lawyer, please contact us immediately for a FREE consultation. We provide professional, confidential advice and counsel regarding your rights. The HENSON LAW FIRM strives to provide the highest quality legal services, client focused representation, and case results, all at a fair and reasonable cost. The firm responds quickly to telephone calls, and constantly monitors new developments in criminal law. Our Tulsa Oklahoma criminal lawyers utilize aggressive strategies to ensure that your rights, your freedoms, and your future are protected to the fullest extent of the law, regardless of the complexity or difficulty of your legal matter. We are committed to protecting and defending the rights of each and every one of our clients. Our offices are located in the historic Beacon Building in Downtown Tulsa, but we represent clients facing criminal felony and misdemeanor charges in Tulsa County and throughout eastern Oklahoma. Feel free to browse our website for important legal information about Oklahoma criminal defense. If you need a criminal defense attorney in Tulsa, Oklahoma, or for one of the surrounding communities or counties, please contact us immediately for a FREE initial consultation. Whether your charges involve a misdemeanor, or a serious felony, it is important that you be advised about all of your legal options. Even if you are facing what some people might call a “minor misdemeanor,” you need to consult with an experienced Tulsa criminal lawyer. Oklahoma criminal charges, whether feloies or misdemeanors, can bring about long-lasting consequences and substantial changes to your family stability, your career, and every aspect of your life. You should never assume that your Oklahoma criminal charges do not require the assistance of a Tulsa, Oklahoma criminal attorney. If you need honest advice and an aggressive defense, please call Tulsa Oklahoma criminal defense lawyer Rob Henson. The HENSON LAW FIRM, PLLC represents clients throughout Oklahoma in communities such as Tulsa, Bixby, Bartlesville, Bristow, Broken Arrow, Claremore, Collinsville, Glenpool, Jenks, McAlester, Muskogee, Nowata, Okmulgee, Owasso, Pawhuska, Pawnee, Pryor, Sand Springs, Sapulpa, and Wagoner. Need a Criminal Lawyer in Tulsa?